For over 37 years and still striving GlassWorks has been commonly known as the top glass company and installation experts of architectural glass throughout the Greater Chicago Metropolitan Area. Moreover, we are proud of our brilliant glass shower enclosures that will please many tastes. That is why GlassWorks is documented as the perfect destination for customers who are looking for the best in shower enclosures and glass shower stalls. Nevertheless, GlassWorks has the aptitude and knowledge to take care of all of your glass shower enclosure requirements and give you the kind of glass shower enclosure you wish for! We have been distributing award-winning services to the residents of Evanston with our comprehensive selection of glass shower enclosures and glass shower stalls since 1997. GlassWorks is known for serving an average of 4,000 customers each year and that is amazing! As one of the North Shore communities that adjoin Lake Michigan Evanston, Illinois has more than 74,000 residents and is found in Cook County. 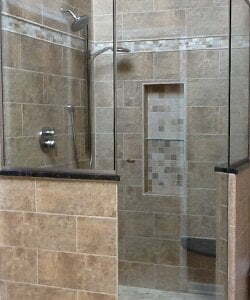 Whenever Evanston residents are in need of a glass shower enclosure or glass shower stall, they reach out to the professionals at GlassWorks. Moreover, Glenview is the home of GlassWorks which is located very close to Evanston being only 6 miles away. Plus our smooth and chic shower enclosures will give your bathroom a level of style that you’ve been looking for. You can also modify your glass shower stalls and shower enclosures exactly how you want it and the Evanston residents really enjoy that feature. Furthermore, our glass shower enclosures and glass shower stalls add sophistication too many bathrooms and our shower glass is often referred to as “safety glass” that ensures you are protected within the reinforced shower glass structure. Additionally, GlassWorks provides our customers with the most inexpensive and reasonable prices. From frameless glass shower doors to neo-angle glass shower doors, glass steam shower enclosures, framed glass shower doors and custom glass shower doors, no matter what kind of glass shower stalls and shower enclosures you are in search of GlassWorks has it all! Likewise, our GlassWorks’ installation technicians treat customers’ homes just like it was their home with respect and care. To schedule your appointment give us a call at: (847)729-5580 to receive a free estimate! Also, complete our online form for a 10% reduction!